1. Press to open the powered tailgate. 2. Press and release to close the powered tailgate. After the tailgate has opened to its set height, it can be manually raised or lowered. 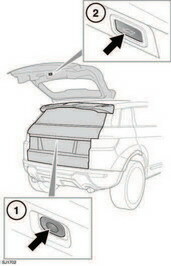 If the tailgate fails to open or close correctly, close it manually then press the tailgate release switch again. As the closing tailgate reaches its lowest position, it will ‘soft close’ to the fully closed position. If the vehicle was previously locked, all doors will re-lock automatically to the previous locked state and the alarm will re-arm.The hazard warning lamps will flash to confirm the lock status. An audible confirmation may also be given. Note: If a tailgate switch is pressed while the tailgate is opening or closing, all movement will stop. However, if a switch is pressed during the ‘soft close’ stage, the open request will be ignored. Before operating the tailgate, ensure that anyone in the vicinity does not have any part of their body in a position where it could be trapped. Note that the ‘soft close’ action does not incorporate object detection. Death or serious injury could occur, even with an object detection system. Object detection while opening: If an object is detected that would interfere with the tailgate opening, tailgate movement will stop. Remove any obstructions and press the tailgate switch again to open. Object detection while closing: If an object is detected that would interfere with the tailgate closing, tailgate movement will stop and then reverse a short distance. An audible warning will be given to indicate a mislock. Remove any obstructions and press the tailgate switch again to close. While the tailgate is open, the locking platform and latch are exposed. Do not manually close the latch as it may also automatically ‘soft close’ and trap items or body parts.